The Indian navigation satellite IRNSS-1H that is stuck inside a rocket's heat shield — together weighing around 2.4-tons — now tumbling in outer space is expected to re-enter the Earth's atmosphere in a couple of months. 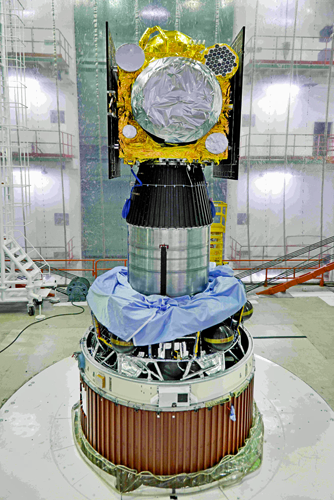 The IRNSS-1H Spacecraft integrated with PSLV-C39. Photo is courtesy of ISRO. However, there may not be any impact on the ground, said a senior official of the Indian Space Research Organisation (ISRO) space agency. According to K. Sivan, the Director of the Vikram Sarabhai Space Center (VSSC), the satellite tracking stations are getting intermittent signals from IRNSS-1H. The fuel onboard the satellite has been depleted by firing the motors whenever there was a signal. The satellite-heat shield assembly is tumbling in space and the satellite is expected to re-enter the Earth's atmosphere between 40 to 60 days. However, the days could vary, as the structure is tumbling. The Sarabhai Centre is part of the ISRO. On August 31, the heat shield of Indian Polar Satellite Launch Vehicle's XL variant did not separate three minutes after crossing the atmosphere. As a result, India's navigation satellite IRNSS-1H was trapped and not placed into orbit. Satellites are housed atop the rocket and covered by a heat shield or payload fairing, which protects them from getting burnt when the rocket crosses the atmosphere. Queried about the possibility of the whole structure hitting the Earth, Sivan said that as per the ISRO's current estimates, whatever remains of the structure (heat shield, satellite and the rocket's fourth stage) will fall into the sea. The Skylab was the U.S.' first space station that fell back to Earth in 1979. The craft weighed around 77 tons and it was a major incident. According to Sivan, the speed at which the rocket crosses the atmosphere on its way up is much less than the speed at which the heat shield-satellite coming down would be. 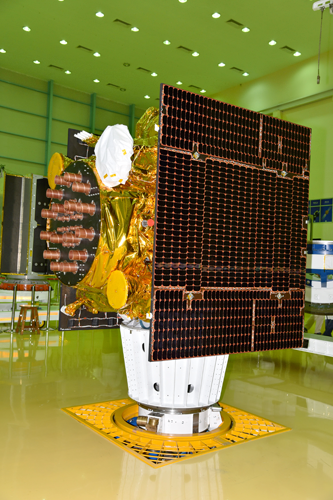 The IRNSS-1H in clean room. Photo is courtesy of ISRO. He added that the rocket crossed the atmosphere at a speed of around one km per second. On the other hand, the heat shield housing the satellite is expected to re-enter the atmosphere at a speed of eight to nine km per second. At this speed of re-entry, the whole structure is expected to be burned up. Simply put, the Earth's gravitational pull increases the speed of the object that is falling towards the planet from the space. This increases the friction and heat and results in the object catching fire. The impact damage depends on the combination of mass and velocity. According to a space expert, the perigee (nearest point to the Earth) and apogee (farthest point to the Earth) of the satellite-heat shield assembly is around 164 km and 6,500 km. As per the original flight plan, the satellite's perigee and apogee were to be 284 km and 20,650 km, respectively. According to an unnamed space expert, the ISRO should calculate the ground trace — the probable point of impact on the ground. Sivan said the ISRO is tracking the heat shield-satellite assembly through its stations and through its multi-object tracking radar (MOTR) at the rocket port in Sriharikota. He noted that the exact spot where the satellite housed inside the heat shield will fall will should be known around 36 hours before the actual impact on Earth.